The Study concept is my attempt at placing the sinister evil of Nazi Zombies in a setting more associated with wisdom and learning. One of my favourite pictures is of the beautiful Morgana standing with a smoking Mauser while dead bodies lie at her feet. Every time I look at this my concentration always falls on her elegance; the corpses get my attention later - and I think this is testimony to Morgana's talents. For someone who had been modelling for only a short time when she did this work I was hugely impressed. The fact that her character's brutality is overshadowed by her charisma - and the way she controls the picture - is hugely manipulative and clever. 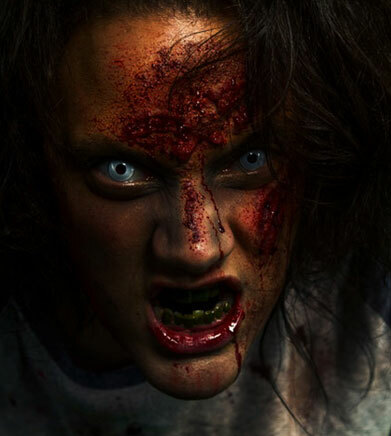 Andrew Dobell - the photographer working on the Nazi Zombie set - brings out the best of the models standing before him. His suggestions, and the way he guides those in his charge, take ideas to a higher level, ensuring a large number of good shots. The vast majority of these can be used as a final artwork and I find myself revisiting older photos and picking out other compositions which dovetail nicely with the newer material. His working partner is makeup lady Tania Claire. Her work blows me away and I love the fact that the gore doesn't worry or phase her at all. Andrew and Tania have a formidable working partnership and I think this shows. For me, the Nazi Zombie work is memorable because of the fear-factor these characters have. I'm only 5' 8" so when I'm surrounded by Major Zeitzler's 6'+ Kommandos I feel rather scared! But I also feel thrilled at having helped bring these monsters to life (if you can call it that) and I hope you like this work too. Shooting the Zombie (or “Rabids”) galleries with Jason Wright was a fun experience. I know some people might not associate “fun” with a Zombie Shoot but it proved to be exactly that, and I know this view was also shared by the rest of the casting – a few of them mentioning the blast they had on their pages on Purpleport. There was blood, gore, and the occasional giggle as my group posed, fought, and wrestled with Zombies. Jason controlled things nicely, allowing the models to let off steam and goof around before reigning them back in for the next set of poses. The work itself consists of a mixture of fake blood and prosthetics with Photoshop blended in later to add greater depth to the Zombies’ look. As with the Nazi Undead Shoot, the backgrounds are entirely Photoshopped. In the near future, I’d like to work on location, or in a Studio with themed rooms providing actual backgrounds. Recently I caught up with Jason to ask him a few questions, and as soon as the screaming stopped he was able to answer. Q: Horror seems to be a great passion for you. How did this interest start? A: Well, I’ve loved horror for a long time – starting at an early age when I watched my first horror film: “The Evil Dead”. Q: Do you have a favourite horror writer? A: I think in terms of horror then Stephen King is my all-time favourite, but there are many up and coming writers out there and some awesome novels which, I hope, make the big screen in the future. Q: What would you say is his best book? A: Stephen King has many books that I’ve enjoyed and a lot of them have been made into feature films. One of my favourites is “IT” as I love the clown and hope to do something with clowns in the future. Q: What is your favourite horror film? A: I don’t have one favourite horror film, as I’m a big fan of the genre, but amongst my favourites are “Hellraiser”, “Evil Dead”, and “Day of the Dead”. Q: What is the best piece of work you’ve produced? A: We’ve done a lot of work in the last few years and one of the many challenges was directing a UK commercial for the “Resident Evil 6” video game for Capcom. Although we had a few weeks to get things ready, we only had one day to film all the scenes required, and with lots of Zombies to prepare with SFX makeup it was a challenging day for the whole cast and crew. Q: Favourite male/female model or actor you’ve worked with? A: I have no favourite as I love working with all the people we cast, and all have different memories and on-set experiences with me. Q: What is your favourite evil creature type/genre? A: I love Zombies and I’m a huge fan of the legend that was George A. Romero. Q: What holiday destination you’ve visited was deliciously creepy? A: Holiday destinations shouldn’t be creepy but I did visit Auschwitz which was very eerie and makes you really think about what it must have been like in those dark times. Q: What creative ambitions are you still working towards? A: I think everyone should have ambitions and goals. I’m looking forward to getting a few feature films out there, and some more novels. I’m also passionate about the magazine we run, so I want to work with more and more talented people to keep up to date with the latest in horror. Peter: Thanks for your insight. Jason Wright: Don’t mention it.